Nose wheel steering block, 29,26,13.5mm 40mm steering arm for 4mm wire with set screw. Neutral color nylon material. No mounting screws included, see photo. Nose wheel steering Block 25x32x16mm. For 4mm nose gear wire. Includes steering arm with set screw. Neutral color nylon material. No mounting screws included, see photo. Du-Bro item. 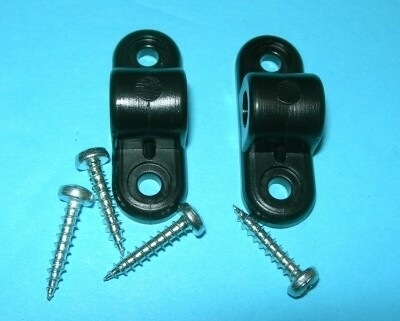 Includes two nylon blocks, four bolts, lock washers, nuts, one spacer. Perfect for nose gear as you can get whatever spacing you want with this style. Perfect part for float mounting also. Useful as nose gear blocks in pairs or for mounting landing gear axles to float backbones and etc. Phillips head screws included. 3mm block is .118" axle hole, slightly under 1/8". Can be drilled out to any size up to 1/4" or 6mm if desired. 2 units per package. 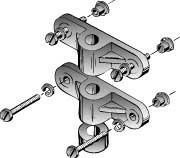 Useful as nose gear blocks in pairs or for mounting landing gear axles to float backbones and etc. Phillips head screws included. 4mm block is .158" axle hole, prefect for 5/32" axles/music wire. Can be drilled out to any size up to 1/4" or 6mm if desired. 2 units per package. Useful as nose gear blocks in pairs or for mounting landing gear axles to float backbones and etc. Phillips head screws included. 5mm block is .197" axle hole, about .010" clearance for for 3/16" axles/music wire. Can be drilled out to any size up to 1/4" or 6mm if desired. 2 units per package. 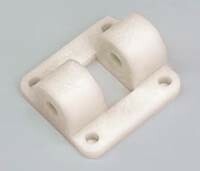 Useful as nose gear blocks in pairs or for mounting landing gear axles to float backbones and etc. Phillips head screws included. 6mm block is .236" axle hole, about .014" under 1/4" axles/music wire. For 1/4" axle use drill out with letter "F" (.257") bit. Can be drilled out to any size up to clearance fit for 1/4" axles. 2 units per package. One each as per photo. One each as per photo. Includes mounting hardware not shown.